6 cancer cases in 3 yrs, residents call meet to devise strategy. Freny Kavarana, a resident of Shree Samarth building in Dadar’s Parsi Colony, says that she feels “horrible” when sitting in her room. Operated for a cancerous tumour in her stomach last year, Kavarana and three other people in her building blame cell phone tower radiation for the disease. 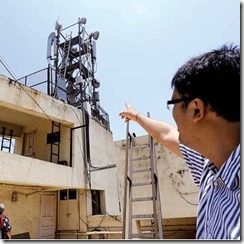 Despite minister of state for communications and information and technology, Milind Deora, stating that there is no proof that radiation from cell phone towers is hazardous to health, citizens continue to be apprehensive. After six cases of cancer were reported in the past three years in the neighbourhood, the residents of the Parsi Colony are a panicked lot. They have put up banners and distributed handbills in the area, inviting people for a meeting on April 28, protesting against the cell phone towers on buildings in the vicinity.